I think the "slum clearance" that took down the south part of the Village which is where Ferris High School and the other school is and then the mudhuts and the projects accross from St. Bridgets also impacted the neighborhood in a very negative manner. My grandparent's home was across from the Montgomery Gardens (Projects). After WWII Urban renewal plans were allotted to level all of those blocks right down to the turnpike. Families had no choice and had to get out after a decided upon fee was paid. Neighborhoods disappeared in a short time around Fremont, Wayne, Montgomery etc. It was quite a wrenching experience for families. In actuality, there was nothing wrong with the homes, businesses, schools etc. which were demolished, it was a political decision. I don't recall the slums or mud huts that are being alluded to here. Were any of the posters there when it happened? I was. Generations of families were moved from in many cases the homes that they were born into. Today those homes would be assessed at ridiculous amounts and taxed commensurately. All the mud hut blocks are an inefficient waste of space and an eyesore. They should all be torn down and turned into higher density, mixed-income housing with new commercial spaces. They make the best homemade mozzarella. Best mootz is at Fiore's in Hoboken on 4th and Adams. Different owners now at Peccoraro's (I am not mistaken am I). They are nice people from Antique (Hoboken), but I loved the old owners as well. So many factors contributed to the changes in Jersey City from the sixties onward. All of them contributed to white flight to the suburbs and a replacing of the cultures and practices mentioned in the article. Looking now at what's become of some of the wonderful neighborhoods that existed in my youth I just shake my head in bewilderment. But then, everything changes, sometimes for the better, sometimes for the worse. pretty sure the Turnpike forced most of the village out, per the original post. 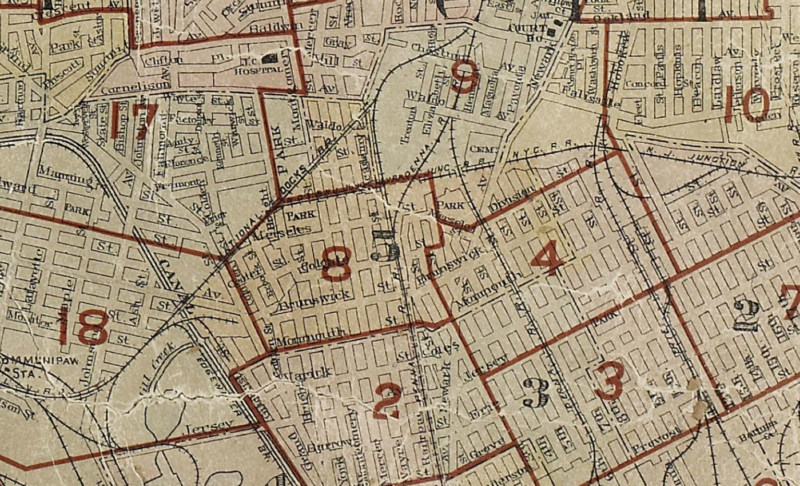 I think that's probably a stretch, take a look at this 1919 map, the TPK did not take out very many residential blocks, certainly not the heart of the neighborhood. There was not much other than the RR north of what is now Columbus. And it wasn't built till 1956. Look at all the stores and bustling street life Brunswick st. Used to have. It’s too bad the VNA forced everything out. LOL. The VNA is less than a decade old! But the HPNA was adamantly against storefronts 2 decades ago. I never figured out why. I think there's a lot of suspects in this 'crime', but nothing conclusive. Was it increased car ownership, rise of big boxes like supermarkets instead of local butchers, greengrocers & bakers, profitability of converting storefronts to condos, or all of the above? "The change came in the ’50s, when the New Jersey Turnpike wiped out a large chunk of the neighborhood and spurred an already growing exodus to suburbia. One by one, stores closed, as their elderly owners died, moved away, or simply shut their doors as business dwindled. With empty storefronts came vandalism and an ebbing of community spirit." I just got lunch at Peccoraro's. Place is like time travel, including the prices! I remember back in the fifties walking into an Italian deli on Brunswick street with my Grandfather. He would use a big metal scoop to take the cavatelli out of a burlap gunny sack that was in a keg. I can't describe what Italian pastry tasted like back then. A cannoli and the pasta chote had taste that still linger in my memory. There was a baker--I think on First street--called Umbep. He was a beautiful man--always gave you a little something when you went into the shop. There's still some old timers in my father's neighborhood on Colgate who remember. If you're lucky they're out in front of their houses when the sunny weather rolls in come springtime. I was told by the Italian neighbors my building used to be a butcher shop. The whole ground floor and brick storefront was rebuilt as an apartment around 1950. I think there was a fire. By the time we started to explore after moving here in late 1978 ... there were only a few stores left. We loved going to the coffee store and the fish market. What happened to the rest... so quickly gone by 1979, 1980? Thanks for sharing this! Really neat to see the pictures of the businesses and the people that ran and patronized them.